California Chrome (even money on the morning line): It took me a long time to warm up to California Chrome and give him the full respect that I do now. I was always skeptical of his Triple Crown run and was the least-surprised person in the world when he lost the Belmont. The rest of his three year old year was forgettable, and his four year old year was basically lost. I wrote him off heading into this season. Oops. He started off by winning the San Pasqual here at Santa Anita. It wasn't a perfect race, but it was solid. Then he headed to Dubai, won a prep race, and then dominated in the Dubai World Cup. I picked against him there, too - though in my defense that was mostly about price. Then he was freshened before heading back to California, where he has won three in a row against good company. Six wins. None short of impressive. He's the best horse in the world right now - or at least the best dirt horse. He's working great, and he clearly likes this track. This is his race to lose, and on his best day only Arrogate has a chance to really challenge him. I'm likely not to bet him to win, though - but that's not because I'm stupid but because I need more value than he is likely to offer because the public is going to be all over him. Arrogate (5/2): This is the kind of horse that makes handicapping so great. He's a three-year-old colt that was slow to develop - he made his first start well after all of the Kentucky Derby horses had finished their last prep race. He didn't break his maiden until his second try in June. Then he won two allowance races. He didn't make his stakes debut until the Travers on Aug. 27. That's no worse than the fourth biggest three year old race of the year, so it was a tough spot to jump into things. He obviously wasn't bothered. All he did was win by 14 lengths while setting a track record at the most historic track in America. It was a magical outing. And he hasn't raced since. So, is this a superfreak sent to us to redefine the sport? Or is he a good horse who had a perfect day at the right time? Trainer Bob Baffert is a master at running three year olds against older horses successfully, and he knows how to win this race - he has won it the last two years. He and Chrome are both horses that like to be near the lead. Their likely duel has the chance to be the greatest thing we have seen since American Pharoah last stepped on the track. I'm a believer in a big way, but then I'm the guy who never bets on California Chrome, so take it with a grain of salt. Frosted (5/1): He was the star of the early summer with two dominating wins, taking the Met Mile by more than 14 lengths, in arguably the performance of the year, and then the Whitney. He was less impressive last time out in the Woodward, but the bad ride was as much to blame as anything. He wasn't nearly good enough against California Chrome in the Dubai World Cup, and I question if he is truly up to this distance. I was hoping his connections would opt for the Dirt Mile - a showdown with him and Dortmund would have been epic. As it stands, though, I don't see him as good enough for anything more than just a piece. Hoppertunity (15/1): Baffert has won this twice in a row, so we can't ignore the 'other' Baffert runner here. He was a decent third in the Dubai World Cup this year, and he won the Jockey Club Gold Cup last time out, so he is capable of big race performances. He wasn't quite good enough in two California outings this year, though, and I'm not confident he can make up the gap. Again, a contender for a piece, but not for the win, unless things blow up. Melatonin (12/1): This five year old is a late bloomer, only coming to graded stakes action this year. He has done very well, winning two at Santa Anita and finishing second in another at Oaklawn. He's coming off a four-month layoff due to illness, though, so we can't be sure if he is going to be back to his best - or if that best is even good enough because he has avoided Chrome so far. I'll toss him, but I'll be worried about it. Shaman Ghost (20/1): This guy had great racing luck and took advantage of it to win the Woodward last time out. He also won the Brooklyn at a mile and a half, though, so he has the stamina here. I just don't think he has the speed for this field. 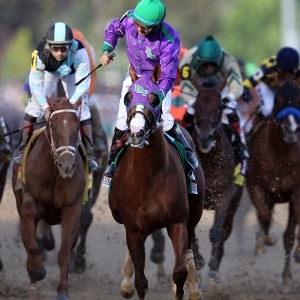 Doc's Sports is offering $60 worth of free member's Breeders' Cup picks absolutely free - no obligation, no sales people - you don't even have to enter credit card information. You can use this $60 credit any way you please on any of our top horse racing handicappers. Click here for more details and to take advantage of this free $60 picks credit today .